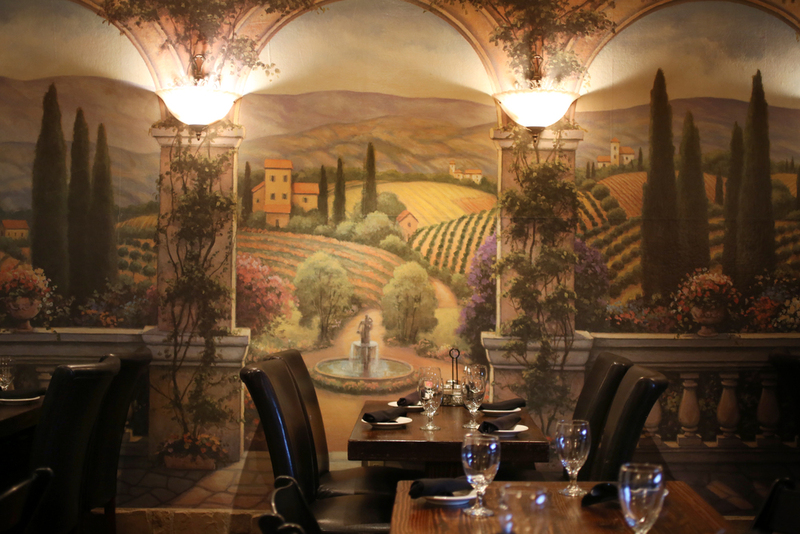 A Taste Of Italy In Your Neighborhood. 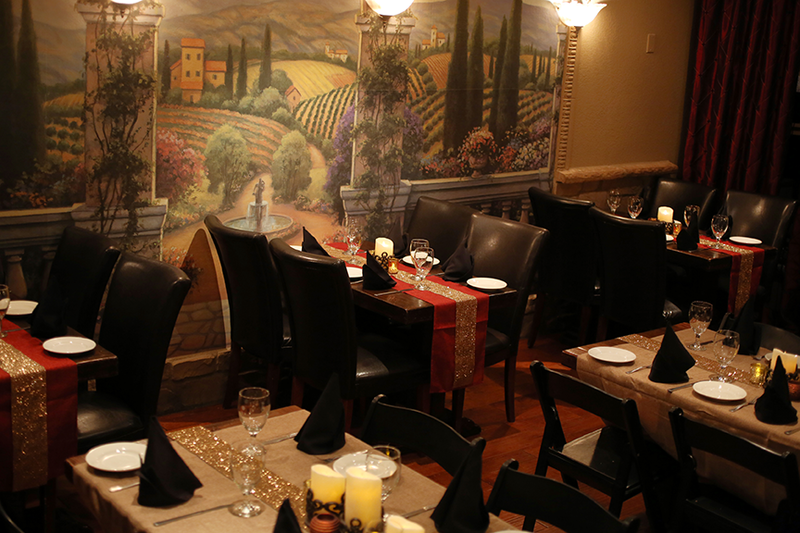 "The Best neighborhood italian restaurant"
Vincitorio's offers the essence of a neighborhood Italian restaurant here in Tempe. 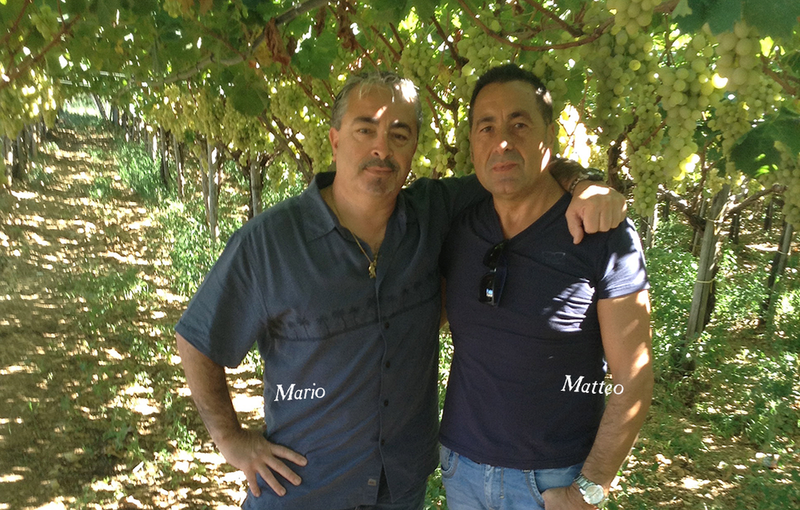 For more than 30 years Mario and Ginger Vincitorio have built on roots in the Apulia region of Southern Italy, where Mario was born and raised in the ancient hilltop town of Rignano (ren-yahno). Vincitorio's is the culmination of this effort, offering traditional Italian meals that inspire warm and enthusiastic conversation. Thank you for sharing in our rich history of food, family, and friends. Call 480.820.2786 from 11a – 1p daily, or book online with OpenTable. Toasted ciabatta bread topped with fresh diced tomatoes, garlic, basil and drizzle of extra virgin olive oil. Deep fried mozzarella sticks served with our delicious marinara sauce. Ravioli filled with a blend of spicy cheeses lightly breaded and deep fried, served with our famous Jalapeño ranch. Fresh asparagus spears wrapped with parma prosciutto, baked and sprinkled with pecorino cheese. Deep fried sliced zucchini in a beer batter, onion crusted string beans, and julienned white and sweet potato fries served with a spicy mayo. Crisp fried calamari, served with our spicy marinara. Mussels and clams in tomato garlic broth. A creamy imported mozzarella stuffed with stewed pears wrapped with prosciutto, lightly baked and drizzled with honey. Prosciutto, sopressata, roasted peppers, fresh buffalo mozzarella, imported olives and grilled eggplant. Orzo pasta in a delicious broth with spinach, carrots and tiny meatballs fontina, gruyere, truffle oil on multigrain toast. Our famous recipe for this decadent creamy mushroom soup. Freshly mixed greens, tomatoes, carrots, cucumbers and black olives topped with seasoned croutons. Crisp romaine tossed with our house made dressing, parmigiano and seasoned croutons. Fresh buffalo mozzarella over fresh sliced tomatoes, artichoke hearts, roasted red peppers and kalamata olives with basil and extra virgin olive oil. Fresh greens topped with olives, artichoke hearts, pepperoni, provolone, Italian cold cuts and hard boiled eggs. Served with oil and vinegar. Thin rib eye steak grilled with spinach, mushrooms and green peppers, served on a bed of lettuce, tomatoes, cucumbers and black olives. Julienned chicken breast sautéed with garlic, mushrooms and green peppers, served on a bed of lettuce, tomatoes, cucumbers and black olives. Crisp romaine tossed with our house made dressing, five grilled shrimp, parmigiano and seasoned croutons. Additional Toppings .95 each: Sautéed Mushrooms, Green Peppers, Fried Onions, Pepperoni, Hot Peppers, Marinara. Grilled spinach, mushrooms, tomatoes and melted cheese, served on a soft Italian roll with our house made chips. Thinly sliced grilled rib eye steak with melted cheese, served on a soft Italian roll with our house made chips. Thinly sliced grilled rib eye steak with melted cheese, green peppers, mushrooms, and pepperoni, served on a soft Italian roll with our house made chips. Thinly sliced grilled rib eye steak with melted cheese topped with lettuce, tomatoes, raw onions, dressing and seasoning, served on a soft Italian roll with our house made chips. All fresh pasta made on site daily. In our delicious meat sauce. Add meatballs or sausage. House made fettuccine tossed in a garlic alfredo with grilled chicken and sun dried tomatoes. Lasagna layered with a blend of Italian cheeses and sliced Italian sausage. Baked and topped with bolognese sauce. Filled with veal in a light tomato cream sauce with peas and mushrooms. Potato dumplings with a fresh tomato basil sauce. Butternut squash filled ravioli in our delicious four cheese sauce, parmigiano, fontina, gorgonzola and pecorino. Angel hair pasta tossed with ground sausage, red and green peppers, onions and mushrooms sautéed in a tomato cream sauce. Little neck clams sautéed with garlic, extra virgin olive oil and white wine, served over linguini. Marios’s handmade ravioli filled with ricotta, mascarpone, parmigiano and mozzarella topped with a fresh tomato basil sauce. Meat ravioli filled with chicken and sausage in a cream sauce with sautéed bacon. Gluten free pasta tossed with grilled chicken in our marinara sauce. House made eggless linguine tossed with extra virgin olive oil, garlic and fresh vegetables. Short rolled pasta shells with grilled chicken and sun dried tomatoes in our creamy pesto sauce sprinkled with pine nuts. Large spinach crepes filled with ricotta, mascarpone, parmigiano, pecorino, and fresh basil baked in a tomato cream sauce topped with melted mozzarella. Large house made pasta crepes filled with ground veal, chicken and ricotta, rolled and baked in a creamy béchamel sauce topped with bolognese. Mario’s handmade cavatelli pasta, in a light meat sauce with meatballs, baked with mozzarella and ricotta. Pasta Dinners and Specialties come with assorted breads and soup of the day or a small house salad. Substitute a small Caesar salad for $2.00. Add a side of broccoli or mixed veggies for $3.50. There is a $5.00 plate charge when sharing a dinner or specialty which includes an additional soup or salad. Sliced eggplant layered with marinara, pecorino, baked with mozzarella, served over linguine. Tender chicken breast sautéed with garlic, mushrooms and pepperoncinos in a lemon butter and white wine sauce, served over linguine. Breast of chicken breaded, topped with marinara, baked with mozzarella cheese, served over linguine. Breast of chicken and homemade sausage braised with white wine, onions, mushrooms, green and red peppers and marinara sauce, served over linguine. Chicken breast sautéed in a marsala sauce with sliced mushrooms, served over linguine. Our house made grilled sausage braised in a white wine and porcini reduction with leeks and sliced mushrooms, served over fettuccine. Jumbo shrimp & scallops in a white wine and garlic sauce, served over angel hair pasta. Mussels, clams, shrimp, calamari and scallops in a spicy garlic tomato broth served over linguine pasta. Fresh Atlantic salmon filets and jumbo shrimp, sautéed with mushrooms and leeks, in our light cream sauce with a touch of tomato, served over fettuccine. A fresh fillet of Atlantic Salmon in a light lemon butter sauce, served over linguine with a side of mixed vegetables. Pork tenderloin topped with fresh sage, Parma prosciutto and melted mozzarella, in a white wine reduction, served over linguine. Breaded and pan fried. Served with a side of Mario’s handmade gnocchi in a butter and sage sauce. Fresh buffalo mozzarella over fresh sliced tomatoes with basil and extra virgin olive oil. mozzarella, sliced tomatoes, imported olives and grilled eggplant. Dressings: Ranch, Jalapeño, Ranch, Blue Cheese, Thousand Island, Honey Mustard, Creamy Italian, Oil & Vinegar, French. Enjoy a bowl of our house made soup with a small garden salad and warm garlic bread. Ham, capocollo, salami, provolone, tomatoes, lettuce, onions, dressing and seasoning, served on a fresh Italian roll with our house made chips. Toasted ciabatta bread layered with sliced tomatoes, fior di latte mozzarella and a dollop of pesto drizzled with extra virgin olive oil, served with our house made chips. Lightly breaded fried eggplant, topped with marinara sauce and melted mozzarella, served on a fresh Italian roll with our house made chips. Our famous meatballs topped with marinara sauce and melted mozzarella, served on a fresh Italian roll with our house made chips. Grilled sausage sautéed with green peppers and our delicious marinara on a fresh Italian roll, served with our house made chips. Julienned chicken breast sautéed with garlic, mushrooms, green peppers and marinara on a fresh Italian roll, served with our house made chips. Chicken breast lightly breaded and fried with marinara and melted mozzarella, served on toasted ciabatta bread with our house made chips. Pasta & Specialties come with garlic bread and soup of the day or a small house salad. Substitute a small Caesar salad for $2.00. Sliced eggplant layered with marinara, pecorino, baked with mozzarella. Penne pasta tossed with garlic and extra virgin olive oil and assorted vegetables. Angel hair pasta in a fresh cherry tomato and basil sauce sprinkled with pecorino cheese. Penne pasta baked with eggplant and marinara topped with melted mozzarella. Spaghetti topped with our famous Bolognese sauce served with our house made meatballs. Fettuccine tossed with grilled chicken and sun dried tomatoes in our delicious creamy garlic Alfredo sauce. Little neck clams, sautéed with onions, garlic, extra virgin olive oil and white wine served over linguini. Mario’s handmade potato dumplings in our creamy pesto sauce topped with pine nuts. Small - $2.00 ea. | Medium - $2.50 ea. | Large - $3.00 ea. Fresh garlic, olive oil, oregano, basil and cheese. Bacon, onions, mushrooms, fresh tomatoes and cheese. Ham, artichokes, mushrooms, sausage, cheese and sauce. Our delicious pesto sauce, garlic, basil, grilled chicken, sun-dried tomatoes and ricotta. Parma prosciutto, fresh Buffalo mozzarella, basil and sauce. Tomatoes, mushrooms, broccoli, black olives, spinach, cheese and sauce. Little neck clams, onions, garlic, olive oil and mozzarella. #1 Steak, bell peppers, onion, cheese and sauce. #2 Pepperoni, sausage, meatball, cheese and sauce. #3 Mushrooms, bell peppers, onions, black olives, cheese and sauce. #4 Broccoli, tomatoes, fresh garlic, basil, cheese and sauce. #5 Ham, salami, bell peppers, cheese and sauce. All Dolci made from scratch in-house. Tiramisu, Full-Sheet - $125. Half-Sheet - $75. Mini Cannolis, 6 for $15. 12 for $30. Rich and creamy vanilla gelato. Rich and creamy chocolate gelato. Refreshing fruit sorbetto served in a natural fruit shell. Coconut, Orange, Pineapple or Lemon. Vanilla and chocolate gelato separated by a cherry and sliced almonds covered in a chocolate coating. Mango, passion fruit and raspberry sorbetto all covered in white chocolate. A heart of caramel surrounded by peanut butter gelato, coated in mild chocolate and decorated with peanut butter drizzle. Strawberry, pistachio and chocolate gelato, all coated with chocolate and drizzled with white chocolate. Vanilla gelato served with a shot of your choice: Espresso, Amaretto or Whiskey. Fior di latte gelato sqirled with carmel, almond crunch and wild strawberries, topped with slivered almonds. Custard gelato swirled together with chocolate and pistachio gelato, topped with praline and pistachio's. Rich chocolate mousse and zabaione, topped with chocolate curls. Light creamy custard garnished with a blend of berries and raspberry liqueur. Mascarpone cream blended with fine Italian Liqueur over sponge cake covered by a layer of espresso, lady fingers, and dusted with cocoa powder. A crispy pastry shell filled with creamy ricotta and chocolate chips dusted with powdered sugar. Biscotti liqueur, Van Gogh Dark Chocolate Vodka, and ice cold mild served over ice. Dark rum, banana liqueur and Lavazza coffee. Topped with whipped cream. Frangelico, Van Gogh Espresso Vodka, vanilla liqueur, and a splash of cream. Served on the rocks. Amaretto, biscotti liqueur, Kahlua and Lavazza coffee. Topped with whipped cream. Amaretto, Frangelico, butterscotch liqueur and Lavazza coffee. Topped with whipped cream. Amaretto, brandy, Galliano, Van Gogh Espresso Vodka and Lavazza coffee. Topped with whipped cream. Kahlua, amaretto, Baileys and Lavazza coffee. Topped with whipped cream. Iramisu liqueur, Meletti cioccolato liqueur, Van Gogh Dark Chocolate Vodka, a splash of cream and Lavazza coffee. Topped with whipped cream. Grand Marnier, Courvoisier and Lavazza espresso with steamed milk. Topped with whipped cream. Rum, gin, Grand Marnier, Galliano, splash of cream and Lavazza coffee. Topped with whipped cream. Served with cream and sugar. Available Monday - Friday | 3:00pm - 6:00pm | Wine room and patio only. Our soft Italian Rolls baked with garlic & fresh herbs & mozzarella served with marinara dipping sauce. Fresh buffalo mozzarella over a tomato slice with basil, black olives, artichoke heart and extra virgin olive oil. Fresh greens topped with olives, pepperoni, provolone, artichoke heart, and hard boiled egg. Served with oil & Vinegar. Deep fried mozzarella sticks served with marinara sauce. Onion crusted batter dipped string beans served with a savory mayo dipping sauce. Batter dipped fries with crumbled sausage sprinkled with paramigiano & rosemary. Marinated artichoke hearts wrapped in sopressata & served with Kalamata olives. Four of our housemade meatballs in marinara sauce topped with mozzarella served with toasted ciabatta bread. Slices of beer battered zucchini deep fried served with marinara and ranch dressing. Breaded chicken breast topped with marinara sauce & mozzarella. Toasted ciabatta bread with fresh diced tomatoes, garlic, and basil with a drizzle of extra virgin olive oil. Grilled sausage sautéed with green peppers and marinara served on toasted ciabatta bread. The wines on this Progressive Wine Menu are grouped in Flavor Categories. Wines with similar flavors are listed in a simple sequence starting with those that are sweeter and very mild in taste, progressing to the wines that are drier and stronger in taste. Vintage, price and availability subject to change. Please check before making your selection. It’s distinctive rose color and wild rose scent is completed by a delicate taste of rose canina and raspberries. Semi-sparkling Moscato is very fruity and fragrant. A combination of floral bouquets and ripe fruit greets the senses. Aromas and flavors of gardenias, apricot, honeysuckle and peach are profuse. Boasting soft bubbles, bright acidity and tantalizing sweetness. The scrumptious flavor of peach bursting with ripeness roused by a frenzy of lively bubbles. Minimal aging results in a bright yellow color with pale golden hues and a fine perlage. An elegant slightly sweet and sparkling wine. Enticing aromas of apple and peach give way to a palate that is satisfying, and harmonious, with crisp fruit flavors and a clean finish. Straw yellow and lively, the bouquet is fresh, fruity and aromatic; on the palate, it combines softness and freshness thanks to perfectly balanced acidity and sugar. Delicate and fruity with a hint of honey on the nose. Delicious and persistent freshness with a dry, well-balanced taste. Festive and vibrant, but rich and complex, with bright aromas of fresh cherry and lemon that lead to luscious flavors of raspberry, yeasty pear and crisp mineral. With pretty aromas of wild berries and honeydew melon, juicy peaches and watermelon, balanced by bright refreshing acidity. Soft and luscious, this refreshing Rose' is richly fruited with hints of watermelon, honeydew and strawberries. This wine is o-dry. Flavors of ripe raspberry and strawberries on the palate. Despite being created during the turmoil of World War II, it actually became quite a success story: It was the first rosato bottled in Italy and exported to the USA. Fresh strawberries and floral notes are rich yet soft and well-balanced, 10% Aleatico a unique and ancient varietal, adds enticing fragrance on the nose and rich texture to the palate. Hints of lime, oranges and tangerines, complemented by white nectarine and pear notes that linger throughout the finish. Light and crisp with refreshing acidity. Ripe citrus flavors with rich aromas of tropical mango, melon, and juicy peach. The bright fruit flavors and layered texture contribute to this wines versatility. Fresh, harmonious fruit set on by a slight sweetness with a long finish full of delicate, tangy flavor. Golden straw color with aromas of fresh fruits. A long-lasting, mellow finish. Approachable, and food friendly with a beautiful expression of crisp lime and passionfruit. The aroma combines multiple tropical characters including grapefruit, fresh peeled tangerine, pineapple and orange zest. The entry is soft and layered, with tropical and herbal characters that lead into a mid-palate combining bright, fresh acidity with a slightly creamy, balanced mouth feel. Aromas of fresh mown grass and bright lemon jump from the glass. Flavors of zesty lime mingle with stony minerals and herbs with just hint of the classic bright grapefruit flavors in the background. The finish is tangy and juicy with bright acidity. A tribute to the great white blends of the world. Full bodied aromas of white peach, pear, and nelon with well balanced acidity and creamy finish. An exuberant Sauvignon Blanc with passion fruit, grapefruit, and tropical fruit aromas. Rich and full, a concentrated blend of sweet and citrus flavors with plenty of weight through a long finish. Attractive pale yellow hues speared by notes of youthful greens. Crisp bright grapefruit, kiwi and lime, dominate the aromatics and are complemented with a hint of caper and lemon zest. This is a rich and vibrant wine with a crisp finish. Zippy, floral and weighted, with notes of lime sorbet, rose petals and a hint of fennel. Ripe peach flavors balance ripe acidity, hints of lime and characteristic mineral notes. Offers exotic fruits, white peach and lychee. Medium-bodied, delicious, pure, focused and mouthwatering. Undeniably fruit forward but maintains a creamy mouthfeel, urged on by French oak, balanced by edgy acids. Some apple and honey character, with a hint of straw. Medium body with a light finish. Ripe aromas of apples and pears complemented by subtle notes of vanilla and butter. 100% Barrel Fermented and aged in 22% French & Hungarian Oak for 7 months aromas of apples, pears and biscotti with flavors of lemon cream, toasty oak and vanilla. Rich and creamy in golden mango, yellow peach, and honeysuckle, with oak barrel aging bring notes of buttered biscuits and vanilla bean. Brimming with pure stone fruit characters, cleansing acidity and muted spice tones. This classic Carneros Chardonnay boasts both richness and minerality. Full-bodied with aromas of Meyer lemon, pear, green apple, citrus, and melon. With a beautiful finish that lingers with nuances of marshmallow, nutmeg and creamy butter. Barrel aged for 15 months in French Oak. Complex fruit tones ranging from white pear and apple to nectarine. Beautifully complemented with toasted oak, vanilla and hints of Crème Brûlée. With aromas of flower blossoms, crisp pears and a hint of honeysuckle. Bright citrus evokes a clean taste of Meyer lemons. Opens with fresh, creamy aromas of ripe pear, apple and citrus, with light butter and spicy oak tones adding complexity. The rich, focused green apple, melon and guava flavors are nicely balanced by fresh acidity and piquant mineral tone. Hints of fresh almonds and acacia and citrus notes. A chardonnay, grechetto blend. Floral aromas of hawthorn blossom and musk fill the nose, followed by subtle hints of almonds. On the palate, it is dry and full-bodied with a fresh flavor. The finish is distinct but attractive with notes of white peaches and bitter almonds. Light straw yellow color with a green hue, a rich delicate bouquet; well balanced, dry & fragrant. This fresh, delicate white from the indigenous Vermentino grape is characterized by wonderful aromas, a certain roundness on the palate, attractive balance and fruit. A fruity floral bouquet of green apples and meadow flowers which are balanced between the structure and acidity. A long fragrant finish with hints of almonds. This well constructed blend combines the freshness and the fruitiness and the aromatic finesse of a Pinot Grigio, the epitome of a modern Italian white wine with the full-bodied smoothness of Verduzzo a local grape made in the unmistakeable Masi style. White peaches, pears and fresh flowers are just some of many nuances that jump from the glass in this crisp, focused white. Scents of red and black currants with notes of vanilla and wild berries. Smooth and silky, this Pinot Noir has classic raspberry aromas and flavors. Dark and rich in color with aromas of dried cranberries, red currant and raspberries. With flavors of strawberry jam and pomegranate. An inviting, delicate perfume emerges from the glass, while bright red cherry and strawberry flavors lightly dance upon the palate. Beautifully balanced with vibrant acidity. Layers of cherry, raspberry, cedar, clove and cinnamon, as well as more floral notes of rose and carnation. Bright, fresh character, lovely mouth feel, and the unmistakable elegance. On the palate, there is a delicious array of red and black fruits, framed by very good structure. Aromas of Alpine strawberries, black cherry, plum, allspice and sassafras. On the palate rich fruit concentration, cherry, raspberry, cola and licorice. Very soft up front with nice length. Plush fruit supported by elegant tannins. Aged 10 months in barrel with a portion of 25% new French oak. Delicious, fresh and richly textured. Beautiful aromas and flavors of black cherry, cranberry, and crisp red apples with notes of black tea, baking spices and coriander. Weighty textured richness in it’s sweet, juicy red cherries, mint, cinnamon and cloves. Cherry pie lives up to its name, although this year leans more toward dark Bing cherries. This vibrant red wine has intense and inviting cherry aromas, with violet hints. In the mouth, the wine shows unmistakably fresh cherry flavors with vanilla notes, balancing acidity and silky tannins. This Bordeaux-inspired red is a blend of 50% Merlot & 50% Cabernet Sauvignon that Fausto Maculan has crafted into a quintessentially Italian wine. The wine offers seductive aromas of blackberries & dark cherries, along with hints of cedar and forest due to the year spent aging in French barriques. On the palate, the wine is dry, full-bodied, and harmoniously balanced. Ample and complex bouquet with notes of cherry, raspberry and red currant give freshness to the wine. Brilliant ruby in color, it delights the senses with a variety of aromas and flavors that include fresh and dried cherries and prunes, sweet spice, and hints of coffee and tobacco. On the palate, it is full-bodied with elegant and velvety tannins. Vibrant acidity brings balance and freshness, and supports a long and harmonious finish. Vigorous and elegant wine is a combination of fruity flavors and spicy aromas. Warm and smooth to the palate it perfectly matches with meat and cheese based dishes. Dried fruit ,plums, and cherries on the nose. Fruity tastes, with hints of coffee and cocoa on the palate. Subtle hints of spice, cocoa and vanilla with notes of dried fruit and cherries. Ruby red color with violet reflections, elegant aroma with fine intensity, hints of red-berried fruit and cherry. Elegant perfume of violet, licorice and tobacco. Firm tannins and a solid structure. Broad, elegant and lingering bouquet with hints of plum and red currant jam. Warm and austere palate that underscores Passum’s generosity and fullness. Dogliani is a historic Dolcetto terroir. In fact, the variety is thought to have originated here and Einaudi was the first estate ever to produce and bottle under this appellation. Ruby red in color with purple reflectinos, fruity aromas, good body, intense, fresh berry & almond nuance. 100% Nebbiolo. A deep pomegranate shows good depth in its red fruit. Soft silky tannins, with a good structure and intense mineral fragrance. Subtle and elegant with cherry, violet and licorice notes. On the palate, it showcases dusty tannins and beautiful length. Well balanced and elegant with a well-structured acidity. It is fresh and clean on the nose with lush aromas of cherry and red raspberry. Complex wine of pure, high-toned aromas and flavors with spice notes surround a core of vivid acidity and moderate tannins. Similar in character to Barolo, but more delicate. This Barolo's superb breed expresses the characteristic elegance of its terroir: brilliant garnet with orange hues, exuberant fruit and spice on nose and palate, luscious, full body and flavors, velvety texture, goudron and spicy finish. Layered aromas of mint, fennel, plum and spices before rich red currant flavors, with rose petal and more mint notes. On the palate the acidity is balanced, tannis silky, with a long finish. Garnet red in color with ample aromas of violets and berry fruit, full and velvety in flavor and well balanced. Intense ruby purple-red color and a fresh almond and mature blackberry fragrance, with a soft, warm, dry and pulpy taste. 25% Syrah, 25% Cabernet, 25% Merlot, 5% Sangiovese, 5% Petit Verdot. Deep ruby red with purple overtones. Intense aromas of black cherries and vanilla. Forest berries, spices, leather, moist earth and dried plum, layered in the aroma. Soft, round taste, well-balanced acidity. This ruby red Chianti Classico has aromas of soft fruit, pomegranate and violet. The impact on the palate is satisfyingly mouth-filling, pleasurably balanced between acidity and alcohol, with a cherry aftertaste. A soft, silky red with berry and spice character plus hints of violet and lavender. Full and powerful, super-integrated tannis and a long finish. Ruby-red with good consistency. The nose opens with a strong fruit component of blackberry, blueberry and cherry. Sweet notes of cotton candy and spicy notes of cloves and nutmeg follow. The tannins are dense, but not harsh. The palate is warm and smooth, lovely persistence and remarkable taste-olfactory correspondence. Aromas of black cherries with alluring wood, smoke, tar and herbal notes. 33% Cabernet Franc, 32% Syrah, 30% Merlot, 5% Petit Verdot. The nose is fragrant, displaying fruit and floral notes and a touch of spice. There are rounded tannins and a fresh, balanced acidity. The Insoglio is an easily accessible wine with plenty of character. 85% Prugnolo Gentile, 15% Canaiolo Nero Merlot. Rich, weighty personality packed with red fruit. The roundness of the fruit carries through nicely to the finish with fabulous balance. 90% Sangiovese, 5% Merlot, 5% Cabernet. Intense ruby red in color with a fruity, spicy bouquet and ripe cherry and berries on the palate. 30% Merlot, 50% Sangiovese, 20% Cabernet Sauvignon. Intense in both color and bouquet, profound notes of dark berries, sweet violets, and spice. Abroad vein of finely-woven, glossy tannins, creating a velvety finish with fruits and spices. Shows ripe, wild cherry fruit aromas and flavors with leather and spice. Medium-bodied and fruit forward with a velvety texture. A complex bouquet, rich in notes that go from small black fruits and spices, to tobacco and tea leaves, with blackberry, blueberry and toffee flavors. Fragrant bouquet of cherries and herbs with hints of vanilla and coffee. The taste is complex, ample, yet round with soft tannins. 75% Merlot and 25% Sangiovese. Bouquet is fragrance rich, with scents of ripe fruits, Vignola cherry, raspberry and currant. Pleasely fresh notes of coffee and toasted hazelnut accentuate the complexity of the wine. Harmonic, fine and elegant with typical aromas of ripe red fruits combined with the spices originating from the long aging in the barrels. Balanced, rich, flavors, with ripe and persistent tannins leading to a long and fruity aftertaste. Fragrances of blue flowers, red berries and slate. The vibrant palate delivers wild cherries and strawberries accented with spice and licorice. Impeccably balanced. A lively, luminous ruby-red color with vermillion highlights. The nose offers a melange of berries, among which blackberry dominates with floral notes of violets. Spicy black pepper and cardamom, full-bodied. The finish is very long and warm; spicy notes are joined by equally intense fruity notes. Warm, balanced flavor with velvet-smooth tannins. 45% Sangiovese and 55% Merlot. The nose boasts an impressive complex of aromas, opening immediately with intense notes of fresh berry fruit, particularly blackcurrant and raspberry, followed by a hint of smooth vanilla hovering in the background. The palate offers an ultra-appealing crispness complementing its flavors of ripe fruit, dried flowers, and spices edged in smoke. Intense, deep ruby red color. Elegance is the main feature. This combined with good acidity gives it a long lasting taste. Sweet and harmonious tannins, as well as an intense bouquet completes this exceptional vintage. 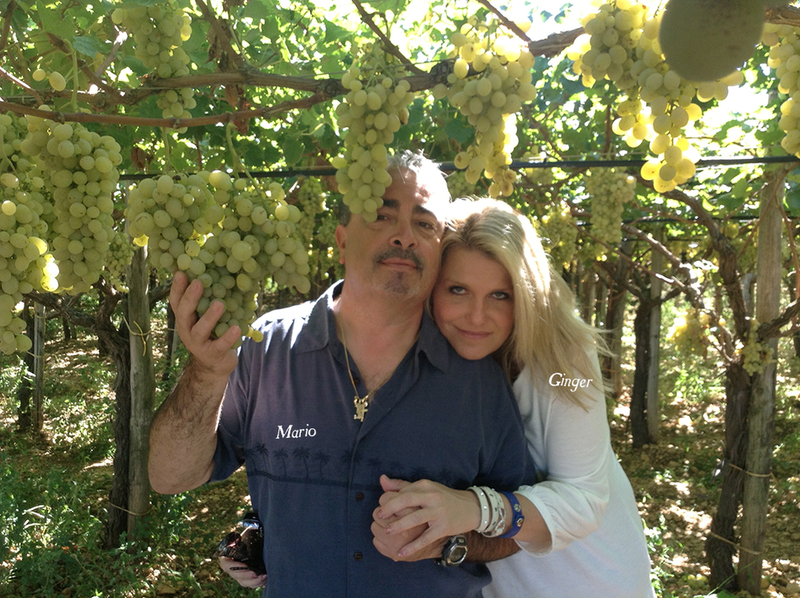 Rich aromas of blackberry, spice and toasted notes, a well-rounded merlot, sangiovese blend. 100% Sangiovese. Garnet red in color, fruity notes of strawberry and black cherry, with subtle vanilla from well integrated wood, good tannins and balance. Ruby red with garnet reflections. Intense fruity and persistent bouquet with floral and spicy notes confirmed on a full well balanced palate. Red fruit, mulberry and sour cherry preserves aromas with notes of vanilla, cocoa, leather, licorice and black pepper. Rich , full-bodied with long lingering taste and ripe balanced tannins. Intense smell of ripened red fruit and secondary spices. Full however smooth, rightly tannic. Intense bouquet of berry fruits, especially raspberries, followed by a smooth velvety finish. 100% Sangiovese. Dry, full and slightly tannic with an elegant bouquet of violets and berry fruits. 70% Sangiovese, 15% Sagrantino, 15% Merlot. Rich ruby red, with notes of ripe red fruit and delicate hints of vanilla. Full bodied, rich, dry with a long finish. The palate is nice and fruity with plum and dark cherry. The fruit is complemented by some black pepper and a hint of mid-palate chocolate. Intense ruby-red in color, concentrated aromas of black cherries and baked red fruits complement undertones of plums, spices, vanilla, and anise. On the palate, velvety tannis and a full-body frame the long, delectable finish of stewed strawberries and vanilla beans. 40% Negroamaro, 30% Primitivo and 30% Cabernet Sauvignon. Fragrant aromas of black cherry and soft violet notes on the nose, complemented by hints of red fruit. The grapes chosen for this delicious wine bestow fruitful aromas of strawberry, cherry and blackberries. On the palate, the wine has a soft, texture and medium body with flavors of strawberry and cherry. Very deep ruby red with violet reflections, fruity, spicy and intense bouquet. A full, mellow, well balanced. Deep ruby-red in color, Ramitello offers aromas of plums, forest fruits, dark chocolate, leather, and licorice. On the palate, a rich and velvety body pushes flavors to continue over a long and intriguing finish. A blend of Negremaro. Nero d'Avola, and Barbera with lush flavors of ripe berries and spices. The color is an intense deep ruby while the bouquet is ample, with dominant notes of bitter cherry, candied fruit, aromatic herbs and distant hints of vanilla and thyme. The flavor has an exceptional powerful and imperious personality, with warm elegant undertones of spices and cream. Ruby red in color with characteristic varietal aromas of red fruit complemented by notes of vanilla and strong licorice spices. The palate is soft and silky, with good body and acidity. Rich mouth coating tannins accentuated by a long lasting finish. Dense garnet red in hue; complex nose of ripe fruit, leather, tobacco leaf and spice; dry and austere but very generous in the mouth, displaying an absolutely magisterial structure and a lingering, well-balanced finish. An intense, inky red, the Nero d’Avola seductively reveals a gorgeous perfume of blackberry liqueur, white flowers and vanilla. Made from Cannonau, Carignano, and Bovale Sardo grapes grown in the loose, calcareous soils of the Costera vineyard, this wine embodies the true idea of Sardinian terroir. Ruby-red in color, aromas of ripe black cherries and tree fruits complement undertones of pepper and licorice. 100% Nero d’Avola Deep ruby red aromas of wild berries and hints of spice. Medium-bodied, intense flavors of blackberry and dark cherry, accented by notes of violet, pepper and exotic spices. 100% Nero d' Avola aromas and flavors of dark and sour cherries, spearmint, spice and oak. Deep ruby in color, with intense aromas and flavors of black fruit. It is full-bodied with a velvety texture and balanced tannins, ending in a lengthy, elegant finish. 75% Garnacha, 25% Tempranillo. Ruby red in color of medium intensity, complex and intense with aromas reflecting Crianza. On the palate it is smooth , well structures and lingers. Brilliant red ruby color with aromas of strawberries, and red currants with an exceptionally silky palate. Enamore is the New World expression of a traditional Italian wine Amarone, produced using the appasimento technique (drying the grapes to increase their concentration) The name, Enamore, a twist on the word Amarone, holds a special meaning in Spanish, "to fall in love.". 45% Malbec, 5% Cabernet Franc, 40% Cabernet Sauvignon, and 10% Bonarda. The quintessential Malbec from Mendoza. Our unique Old Vine style delivers complex aromas of sweet ripe berries and cherries with notes of toasty vanilla oak for balance. Firm and full bodied, blending indigenous Malbec with dried Venetian Corvina. Aromas of dark fruit and a balsamic herb complexity. Flavors of plum and forest fruits interplay with elegant tannins. Fruit from Mendoza. Vinted and bottled in Rutherfod, Napa. A dense dark red, opens up with the scent of ripe plums and cherries with hints of dark chocolate. Tannins and acids wrapped in red fuits with a touch of sweetness that carries into the finish. A dry red that is light in body but deceptively rich in flavor. With aromas of fig, caramelized sugar, coffee and chocolate. A blend of Cabernet, Zinfandel, Merlot and Petit Syrah. Generous aromas of ripe berries and dark stone fruit with fresh flavors of cherries and plum are met with soft and velvety tannins, finishing with a hint of mocha. The Federalist "Honest Red Blend"
This three part Harmony of 55% Merlot, 30% Zinfindel, 15% Cabernet Sauvignon grapes sourced from three renowned American appellations. Mendocino County, Napa County and Sonoma County. Juicy black cherry, raspberry jam and fresh mint create a vibrant palate that is rounded out by a smooth finish of caramel and spice. A collaboration between the artist Scott Campbell and wine maker Clay Brock. Big, bold and rich with a luxurious finish. An original California red wine from the Wagner Family. Features dark red varietals including Zinfindel and Petite Syrah, with lush flavors of cherries and baking chocolate. Enticing aromas and flavors of black cherry and blueberries with hints of chocolate, anise and toasted oak. An elegant blend of Cabernet Sauvignon and Syrah that shows complex flavors of blackberry, pomegranate and red currant with undertones of oak and vanilla. Enticing aromas of Bing cherries, dark chocolate, clove and roasted fig. Persistent flavors of ripe raspberry, boysenberry and vanilla linger harmoniously, for a smooth and luscious finish. It is a deep ruby color with full body and smooth tannins. Wonderfully aromatic and fruity, blending silky flavors of blackberry, cherry and black currant. This little devil is wrapped in a velvet robe. Full with density and bursting with flavor. Dark fruit, cherry, blackberry. Brimming with cedar, pipe tobacco and earth. Truth in a name: Velvet. Rich concentrated aromas of raspberry, plum, mint, cedar and chocolate that lead into flavors of nutmeg and vanilla. Bright ruby red with a pronounced nose of ripe blackberry and cloves. A juicy and velvety wine with jammy notes of black fruits and dark plums. Rich dark aromas of blackberries, violets, and crushed white pepper. A jammy array of berries and black cherries dominate the palate, complimented by hints of vanilla, sassafras and exotic oaky notes that linger through the finish. Dark color with bright ruby highlights. Intense nose of dark cherries, cocoa, and vanilla. Aged for 12 months in oak barrels. The finish is soft and seamless. Complexity, tannins, inferior to non. BLackberry, boysenberry, white pepper, savory herbs and crushed granite. On the nose you will find aromas of plum, red cherry, dark fruits, spice, a touch of oak and vanilla. The 2009 has a round full mouth feel with jammy ripe fruit flavors of dark fruits, cherry, black plum, black pepper, dried orange peel and frozen strawberry. Fruit forward with blackberry and black cherry aromas with spicy notes. 50% Zinfandel, 50% Syrah. Good entrance with a rich mouth feel and supple tannins. With berries and spice on the nose, dark sweet fruit fills the palate with just a hint of black pepper. From the Prisoner Wine Company. Dark ruby color with bold aromas of blackberry, plum and clove. Rich and full, with juicy acidity encircled in flavors of Mexican Chocolate, cherry and vanilla extract. Flavors of cherry, dark plum and a hint of coffee. Rich, yet approachable tannins provide for a long smooth finish. Subtle flavors of boysenberry, pie crust and allspice, surrounding a bright cherry core, with a lengthy, lush finish. Rich layered flavors of blackberry, black currant and cocoa with soft, supple tannins. Ripe black plum, blackberry and blueberry flavors integrate beautifully and are complimented by cocoa, spice, and toasted oak. Aromas of blackberries, dried herbs, and dried floral which follow to the palate on a rich wave of concentrated flavor. There is a textural sensation of dark chocolate on the deliciously long finish. An intriguingly deep color leads to highly fragrant aromas and fleshy dark fruits, sage, bay leaf, and a gently touch of black pepper spice on the palate with a savory finish that all work seamlessly together. Supple and generous, yet serious in structure showing sweet plum, berries cocoa, and desert herbs. A pretty garnet color with aromas of black figs, plums, sandalwood and cinnamon. Aromas of graphite, leafy herbs, and dried voilet nuances to go with ample kitsch and black cherry fruit. Full body, rich and elegant with generous ripe plum, black cherry, herb and fresh earth notes. Excellent balance, finishing with a long and clean aftertaste. Wonderfully fragrant, complex aromas of ripe blackberry and boysenberry fruits complimented by scents of loam, spice box, dark chocolate and toasty oak. Beautifully balanced and richly textured on the palate, its concentrated black cherry, wild berry, cassis and mocha flavors are supported by supple tannins and extend into a long, chocolaty finish. Pale straw gold in color, the wine is lightly sweet with a vibrant acidity and round, velvety texture. White fruit aromas and flavors are offset by light oak notes. This sweet wine shows fresh, rich blackberry and cassis aromas. On the palate, it has a well-knit structure, with a velvety, luscious mouthfeel and smooth tannins. With an intense amber tawny color, the wine has sweet, elegant apricot flavors, delicate wood notes and rich, seductive aromas of mature fruit. Full-bodied and highly concentrated. Another magnificent and finely-balanced old tawny blend of outstanding richness and complexity. This rare Port is traditionally enjoyed as a dessert wine or at the end of the meal. Ideal for summer drinking. With an intense amber, tawny color, the wine has voluptuous, spicy, tangy marmalade and nutty aromas with raisiny notes and toast from the long aging in cask. The full palate is very rich, with concentrated flavor and has a long, mellow finish. 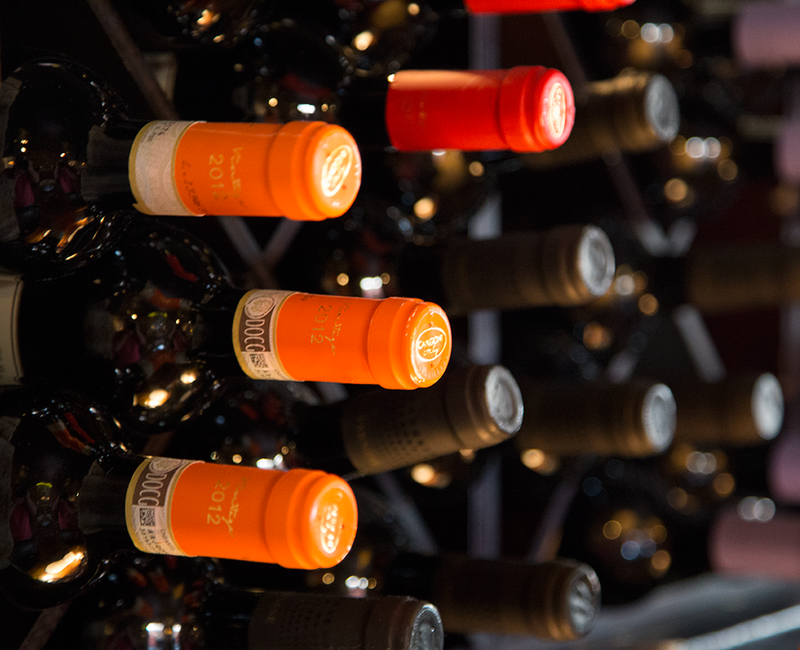 EVERY BOTTLE ON OUR WINE LIST IS 1/2 OFF! Thank you for inquiring about our private dining room and catering services. We provide a complete variety of services for business events, private parties, wedding rehearsals, reception dinners and more. Our beautifully remodeled private dining room offers extra conveniences to enhance a business meeting or any special occasion. 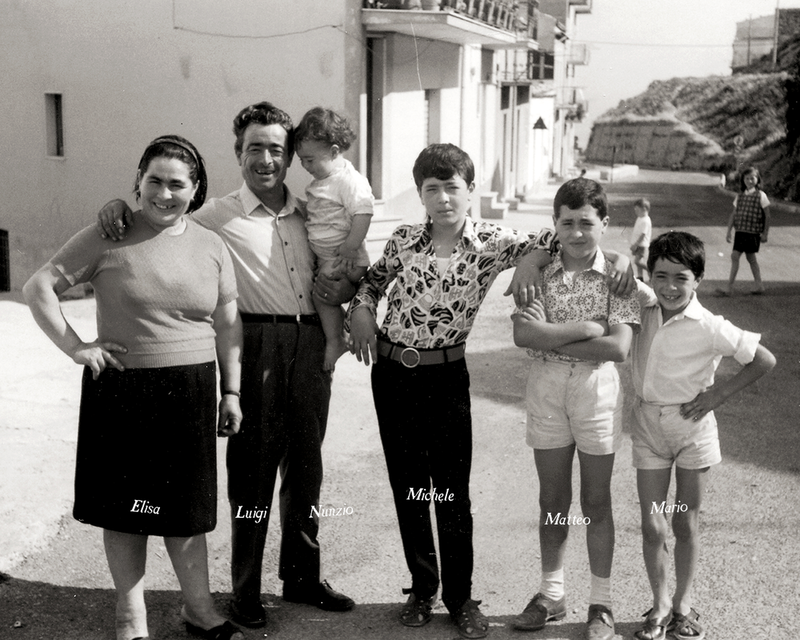 Or bring a taste of Italy to your home with an authentic family style dinner. • 5' x 8' screen and overhead projector that is laptop compatible. • Satellite radio offering many musical choices. • DVD player for showing your favorite photos. NOTE: Must order 2 days in advance. All Family Style menus include Soft Drinks and Iced Tea when utilizing our private dining facilities. NOTE: Does not include tax or gratuity. Descriptions for all the family style entrees can be found on the take out portion of this menu. NOTE: Half tray serves 8-10, Full tray serves 20-25. House made, brushed with extra virgin olive oil and fresh herbs, sprinkled with pecorino cheese, served with marinara sauce. Ravioli filled with a blend of spicy cheeses lightly breaded and deep fried, served with our famous jalapeno ranch. Mario's famous handmade Italian style meatballs. Penne tossed with grilled chicken and sun dried tomatoes in our creamy garlic Alfredo. Corkscrew pasta with assorted vegetables in a light garlic and oil sauce. Our delicious meat sauce over rigatoni pasta. Ground sausage, green and red peppers, onions and mushrooms sauteed in our tomato cream sauce over bow tie pasta. Breast of chicken breaded, topped with marinara, baked with mozzarella cheese. Tender chicken breast sauteed with garlic, mushrooms and pepperoncinos in a lemon butter and white wine sauce..
Chicken breast topped with fresh sage, mozzarella and prosciutto sauteed in a white wine reduction. Breast of chicken and homemade sausage braised with white wine, onions, mushrooms, green and red peppers and marinara sauce. Sliced eggplant rolled with ricotta, fresh basil, baked with mozzarella and marinara sauce. Chicken breast filled with gourmet cheese and Italian herbs, baked in a marsala wine sauce with mushrooms. Available for groups of 20 or more, with no additional fees Monday through Friday 11am - 2pm. If you wish, we will provide a private lunch buffet of the day, which includes salad, three main entrees, garlic bread and a soft drink for $8.95 per person. (Tax and Gratuity extra). Available for groups of 20 or more, our private dining room is available for afternoon and evening happy hour, business or special occasions, with a semi-private setting. No additional fees Monday through Thursday. Dinners are served family style from a pre-selected menu. 20 guest minimum required Monday-Thursday. 40 guest minimum required Friday-Saturday. Want the room really private? 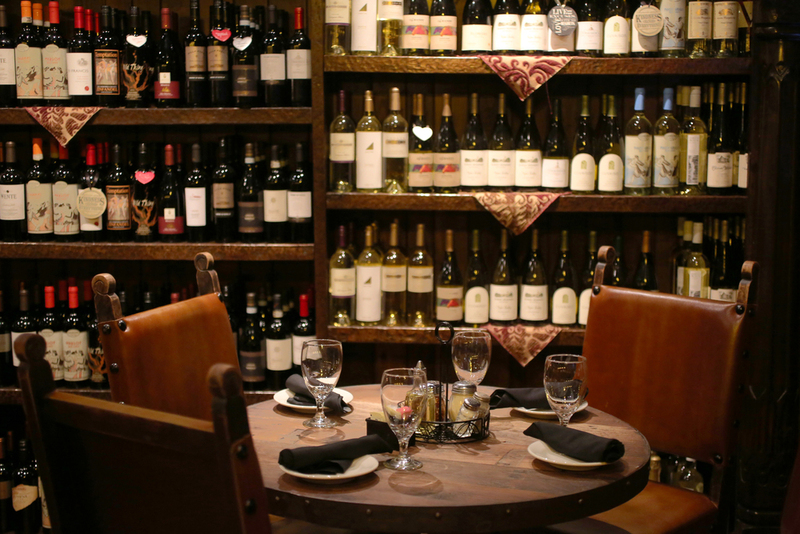 If you want ensured privacy for a meeting or special event, we will separate the room from the The Wine Room by closing our handcrafted alder doors. $100 non-refundable fee is required at the time of reservation. 40 guest minimum required Friday-Sunday. 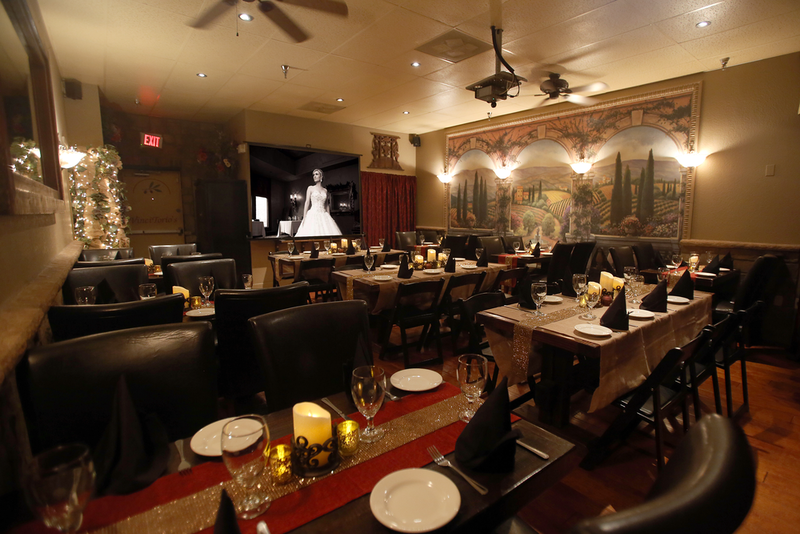 Host your wedding reception in The Wine Room and adjoining private dining room. We are flexible in table placement and can accommodate up to 100 guests. Food will be served buffet or family style, depending on the number of guests. Available Saturday 11am - 4pm. Sunday Noon - 4pm. Separate checks? - Cash Bar? Yes and Yes. Just make arrangements with us when you make your reservation. Choose one entrée per guest. Gluten free pasta tossed with grilled chicken in a pomodoro sauce. All entrées come with soup of the day or a house salad. Substitute a small Caesar for $2.00. Chicken scaloppine in a lemon butter sauce, white wine, capers, artichoke hearts, and sliced mushrooms, served over linguine. Mussels, clams, shrimp, scallops and calamari in a spicy garlic tomato broth served over linguine. Tender chicken breast sautéed with garlic, mushrooms and pepperoncinos in a lemon butter and white wine sauce. Sweet Caroline “Lemon Drop Martini”, Love Shack “Blood Orange Martini”, Pink Cadillac “Berri Cosmo”, America Pie, “Apple Pie Shot”, Pour Some Sugar on Me "French Martini"
Armed with her guitar, Phoenix singer and songwriter, Sarah Vanell performs every Wednesday night at Vincitorio’s Restaurant. Remember, 1/2 off all wine bottles Wednesday night! Bring your list of songs you want to hear! These musicians know them all. Billy Ward and Julie Simpson play Dueling Piano’s, and Matt Medrano keeps the beat the last Saturday of every month. And Billy Ward plays every Friday and Saturday night himself. Every Thursday, Billy Ward and Drummer Nick Segall play JAZZ in Wine Room.